Watching cricket can be trying if you do not know the rules governing the game. Granted, this bat and ball game looks deceptively simple, but to appreciate fully the finer point of the matches, a solid understanding of 10 basic rules comes in handy. 1. Two teams, 22 players:Ai? ?Purdue UniversityAi? ?explains that a cricket match is little more than two teams facing off against each other. Each team has 11 players on the field. One of a team’s 11 players is the team captain. This player is primarily responsible for ensuring that a team has no more than 11 players on the field at any given time. 2. Umpires’ rulings are final:Ai??Lord’sAi? ?notes that the umpire is the final authority in play decisions. Players who fail to follow directions or who balk at an umpire’s decision will be turned over to the team captain for dismissal or other discipline measures. ther team member now takes a turn to bowl the next over. 4. Game duration is negotiated:Ai? ?Teams may agree to play two innings and limit the number of hours they will be on the field. In the alternative, the teams may opt to only play one innings but do so by agreeing on the number of overs ahead of time. days. Since test matches must use natural light only, playtime is set between 11 a.m. and 6 p.m.
6. Batsmen do not have to run:Ai? ?American audiences are familiar with baseball players tossing aside their bats and running from base to base. In cricket, the batsmen carry their bats with them as they run and use them to touch the ground marking their progress. It is noteworthy that they do not have to run. 7. Boundary fence hit equals four runs:Ai? 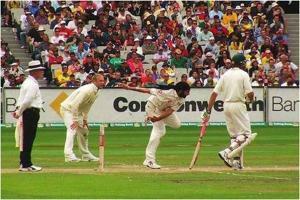 ?Cricket recognizes that a batsman’s ability to hit the fence with a bowled ball should equal four runs. If the ball goes beyond the boundary fence, the batsman scores six runs. Ai??8. Overthrows allow for additional runs:Ai? ?Should fielders neglect to throw the ball back, the batsmen will continue taking runs. If the ball rolls to the boundary of the field, the runs already completed are added to the automatic four-run score a boundary hit earns. 9. Time wasting is penalized:Ai? ?It is well known that cricket games can go on for days. In order to curtail time wasting, a new batsman is out of the game if it takes him longer than two minutes to take the field after a wicket fall. 10. Field placement is optional:Ai? ?The team captain may choose to place team members in a number of field positions. Each captain uses this strategy to the advantage of the team and to throw off the strategy of the opposing team. Look At Here Now help with writing my dissertation.